Serum specimens from 138 patients suffering from chronic respiratory disorders including 63 with allergic bronchopulmonary aspergillosis (ABPA), 20 with suspected ABPA, 25 with pulmonary tuberculosis, 14 with bronchial asthma, 10 with chronic bronchitis and 6 with miscellaneous pulmonary conditions were studied for circulating antibodies to Aspergillus. 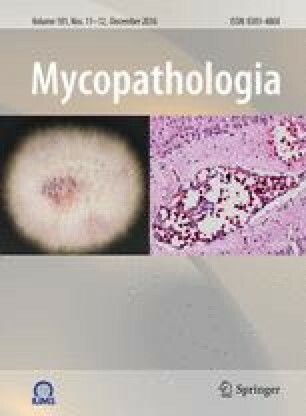 The ammonium sulfate test was employed with an iodine-125 labeled mycelial component derived from Aspergillus fumigatus. When compared to normal controls from the same area, this test indicated that sera from 82 per cent of patients with ABPA had elevated binding titers to the radiolabeled antigenic component. Immunodiffusion using a culture filtrate antigen from A. fumigatus, revealed precipitating antibody to this fungus in 89 per cent of sera from ABPA patients. The majority of patients with ABPA demonstrated marked elevations of total serum IgE, moderate elevations of serum IgA and IgD and slightly increased levels of IgG and IgM. This study was supported in part by Research Grant AI 10940 from the National Institutes of Health and by NHLI Contract N01-HL-3-2942(B), and forms a part of the Ph.D. thesis submitted by Z.U.K. to the University of Delhi.